Hello, and welcome back to our blog here at Comfort Solutions Heating and Air. 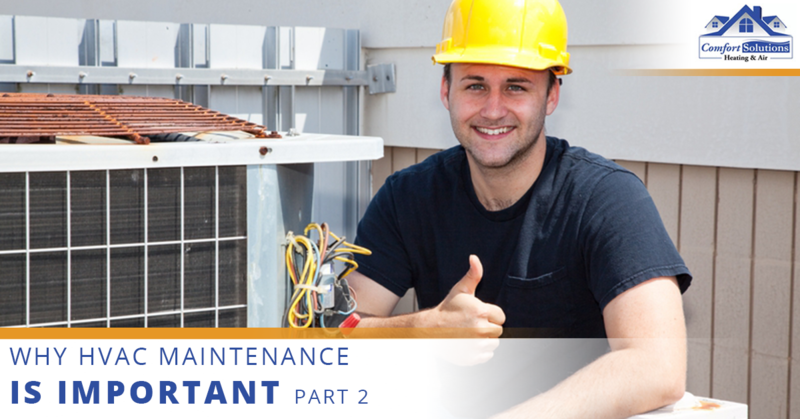 This is part two of our blog series about why HVAC maintenance matters. Last time, we talked about how maintaining your HVAC system will reduce energy bills, improve air quality, and to help you stay on top of warranties before they’re gone. This time, we’re going to talk about more specific maintenance procedures that will help you run a more efficient heating or cooling system. 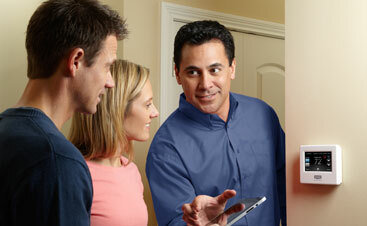 If you have any questions, feel free to contact your local HVAC specialists at Comfort Solutions Heating and Air. Thermostat settings – Without your thermostat and HVAC system in sync, your furnace or AC might be doing more work than it needs to. Many thermostats have scheduling systems that start or stop heating or cooling depending on whether you’re home or away on vacation. It would be a shame to get back from a long vacation only to find out that your heating or cooling system was on the whole time! Lubricate components – Moving parts will create friction, and without proper lubrication, this could lead to increased energy bills. Inspect condensate drain – Clogged drains in your central air conditioner or furnace can lead to increased indoor humidity. Humid indoor air will increase the change that mold will grow inside your home, especially if it’s hot too. Refrigerant levels – Having too much refrigerant or not enough in your system will reduce its life and energy efficiency. Check gas and oil connections – Gas and oil connections that don’t function properly, either due to a dirty burner or cracked heat exchanger will not only reduce energy efficiency in your home, but it can be a fire hazard. In addition to contacting a certified HVAC specialist, there are several things you can do to help preserve the life of your furnace or air conditioner. Next time your HVAC specialist makes a visit for annual or bi-annual maintenance, make sure to ask what you can be doing on a regular basis. Replacing air filters is a must, however, they may advise that you inspect it and clean it occasionally. Don’t you hate it when you go to turn up the AC on a hot day but it doesn’t start up? 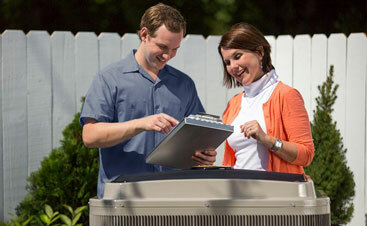 Just like cars, HVAC systems break down every once in a while. It’s inevitable, but at the same time, you can avoid frequent breakdowns by maintaining your system better. Not all HVAC systems are created equally, so there isn’t any one thing that may be causing a breakdown. However, the good news is, if you call a qualified contractor, they will be able to help you out and afford you the comfort of having a reliable system running all year long. Comfort Solutions Heating and Air is your Top Rated Local® HVAC Company in Lawton, Oklahoma and the surrounding areas. Our focus is on providing each of our clients with the highest quality services for the lowest price possible. If you aren’t 100 percent satisfied with the work we’ve done on your system, you’ll get a full refund. Contact us today to learn more.